← What’s The Deal With ‘Unmarked Crosswalks’? Although the population of Princeton is estimated at around 28,572, every day a further 24,363 people enter the town to work. A far smaller proportion of Princeton residents leave town to work, making the daytime population of Princeton around 46,652. 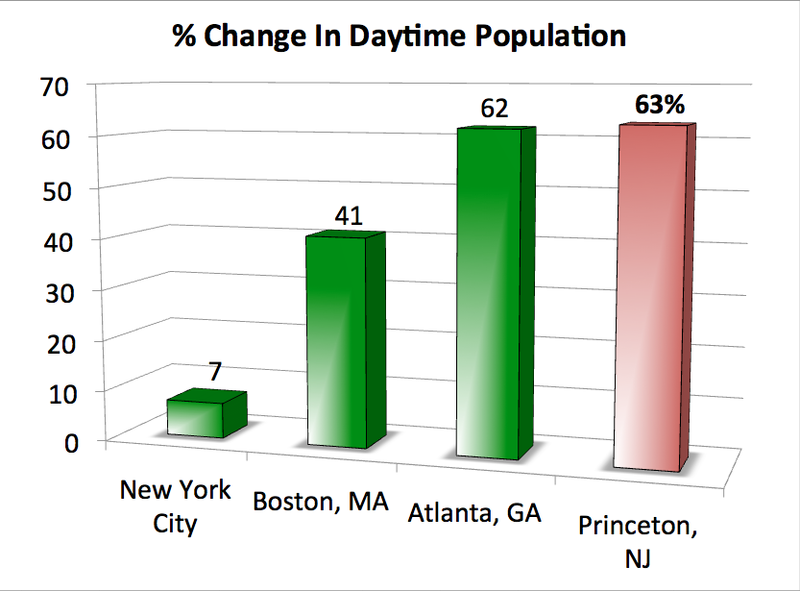 When we express this change in daytime population as a percentage, Princeton shows a daily increase in population of 63%. By contrast, New York, the Big Apple, only increases in population by 7% each day. Even though half a million people travel into New York to work each day, the vast majority of the city’s workforce lives in New York City. Philadelphia and Chicago, likewise, are functioning cities that accommodate most of their workforce, and show only single-digit daily increases in population. Boston shows a somewhat higher daily percentage change in population, at 41%, whereas Atlanta, GA, also known as ‘Sprawl City‘, has a particularly high daily percentage change, at 62.4%. But Princeton has a higher percentage change than all of them! Princeton houses fewer of its workforce than many of the biggest job magnets in the USA. Why is this? It’s because as the economy and population of Mercer County has grown, Princeton has added a disproportionately small number of new residential units. Not enough houses and apartments have been built and the housing stock that already exists has ballooned in price relative to surrounding municipalities. This effect has been felt most keenly by the middle-class, who have largely abandoned Princeton, moved to more affordable townships nearby, and resigned themselves to a daily slog in traffic to their day jobs in Princeton. The median household income in Princeton is now $106,000, versus a New Jersey average of $68,000. Long-time residents can remember a time when people of average means could afford to buy a place in Princeton. It is possible to turn back the trends of the last decades. All we have to do is recognize the fairness and benefit of adding new homes for the hard-working people who already come here to work every day. We are smart enough and we have the resources to find homes for all Princeton workers. Other towns have already done so. Consider Charlottesville, home of the University of Virginia, which houses a population of 43,475 on an acreage about half the size of Princeton. The population density there is more than double that in Princeton, yet anyone who has visited Charlottesville will find an unhurried town with incredible character, a vibrant downtown and excellent integration of the historic university and local population. It will be hard to provide homes for people unless we show some flexibility. We have to be solution-oriented, and show a ‘can-do’ attitude to increasing accessibility to the Princeton residential market. That means staying open-minded about denser, multi-family apartment and condo buildings that can efficiently house more people. If we take a ‘no-way’ attitude, we are accepting that Princeton will increasingly become an enclave for the rich, where middle-class people can work but can rarely expect to live. Right now, redevelopment at the former Princeton hospital site offers the chance to add 280 residential units at an infill, walkable location. The latest plan is a big improvement on the earlier plan, but could potentially benefit from further public input at the upcoming Planning Board meetings. Rejecting the plan and the homes it will bring to Princeton should not be our aim. We should not fear the density of this development. It is an opportunity, not a problem. We should look forward to opening the door so more people can live and work in Princeton, and celebrate the fact that every worker who lives in Princeton is one less person driving in from the townships, one more person contributing to our tax base, and one more person supporting our local stores and businesses. This entry was posted in Affordability, Density, Downtown Vibrancy, Princeton. Bookmark the permalink.